Unfortunately, the teaser picture image of the 2014 Scion tC is about as much of a tease as it gets, offering us no real idea as to what might change for the 2014 model year while the press release announcing the New York debut is every bit as vague as the picture. The shot on the right, showing the 2014 Scion tC from above is the only image offered thus far and all that we can tell is that the 2014 tC will have a very similar overall shape to that seen on the 2013 model year tC. It looks as though there will still be a harder angle where the roof meets the back glass - as opposed to the curvy transition found on the first generation tC. It also looks like there might be a redesigned headlight and grille area that has a flatter appearance than the current models which have lights that angle up and around into the front fenders. Then again, that might just be an optical illusion caused by the random white highlights in this first teaser image. While the exterior design of the 2014 Scion tC probably won’t make any major moves, we are hoping that the company follows the trend of the first to second generation tC and increases the power output. The first generation tC (2005-2010) offered 161hp and 162lb-ft of torque but with the introduction of the second generation Scion sports coupe, the power jumped to 180 horsepower and 173lb-ft of torque. While the company surely doesn’t want to infringe on the popularity of the new Scion FR-S with 197hp and 151lb-ft of torque, the fact that these two cars are so different from each other should allow the company to safely up the power of the tC near the 200hp range without having any real impact on FR-S sales. More importantly, the tC gained some weight between the first and second generation so perhaps the application of high strength (and lightweight) steel would allow the car to be basically identical in its structural design while weighing less than the 2013 model year. A few more ponies and a lighter curb weight would make the tC even more entertaining to drive while also possibly being more fuel efficient. Finally, if I were a betting man, I would expect that the 2014 Scion tC would feature some new infotainment technology inside such as a revised sound and navigation system with an enhanced interface with gadgetry like steering wheel controls and an integrated touchscreen. Of course, the “new” 2014 Scion tC could be a far less substantial refresh than I am speculating but with so few sporty, efficient compact coupes available in the US right now – the 2014 refresh of the tC is more about staying ahead of the market than keeping up with the competition. That being said, any improvements to this already popular compact coupe should help in keeping this young, exciting brand nice and fresh – giving prospective buyers a reason to stop by their local dealership. As the image above on the right explains, the 2014 Scion tC will debut on Thursday, March 28th at 9:55am at the 2013 New York International Auto Show. 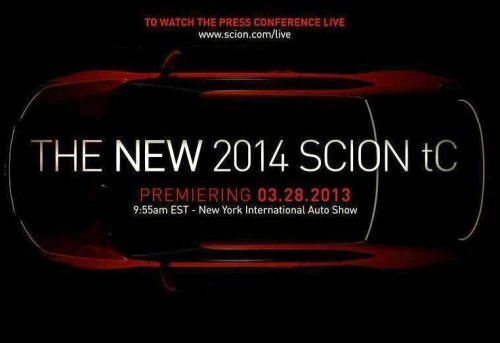 Stay tuned to TorqueNews for the debut of the 2014 tC and all of the big debuts from the Big Apple auto show!